Home Children's Ministry SLAYING THE E-MAIL MONSTER! 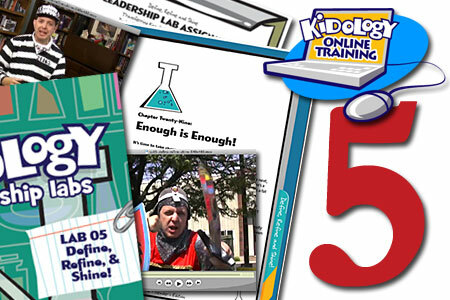 The 5th installment of Kidology Online Training is now available. This Leadership Lab, titled Define, Refine, and Shine, is priced at only $9.99 for Kidology Members so that everyone can afford this valuable resource. We think it’s that important! Are you exhausted? Stress robbing you of the joy of ministry? Overloaded with more to do than time and resources allow? Then now is the time to evaluate your life and ministry. Yes, life and ministry. In this Leadership Lab, Karl Bastian will walk you through a thoughtful process that will bring definition, margin, and joy back into these areas. PLUS! This Lab includes a FREE BONUS REPORT: Slaying the E-Mail Monster. Learn 10 AMAZING SECRETS from a leader who personally manages hundreds of e-mails a day. What’s he’s learned the hard way will put YOU back in charge of your computer again! Purchase the accompanying Leadership Lab Download Kit for the complete training experience! That was too funny!! I was tired watching you.